Despite unprecedented victories on the part of humanity, the war with the alien Chiata Horde drags on. The Chiata may be bewildered by the cunning tenacity of General Alexander Moore and the men and women who fight at his side, but they have no intention of beating a hasty retreat. In fact, intelligence suggests that the Chiata Invasion is at hand, and with numbers sure to overwhelm humankind. But hope has come from an unlikely source: the Thgreet, long-dead inhabitants of a world ground under the heels of the Chiata millennia ago. In the crumbled ruins of their homeworld is a map—and it may lead to victory. Meanwhile, Alexander Moore’s daughter, Deanna Moore, now known by the callsign “Phoenix,” wages a personal war on the Chiata. 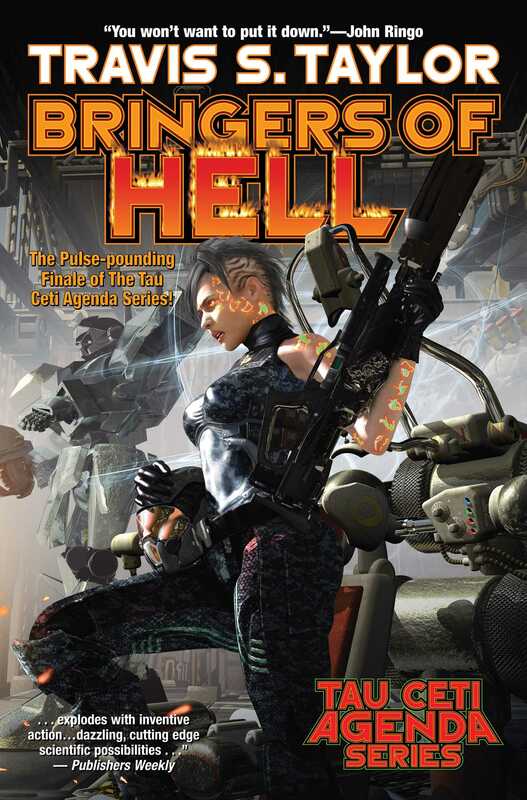 Grievously wounded in the battle for Thgreet and rebuilt with state-of-the-art cybernetics, she leads a group of mecha-suited Marines known as “The Bringers of Hell.” Once a tough-as-nails Marine, she has been reborn as an implacable scourge to the Chiata. And nothing will stand in the way of her mission: to make the aliens pay. #6 in the Tau Ceti Agenda series, from Travis S. Taylor.